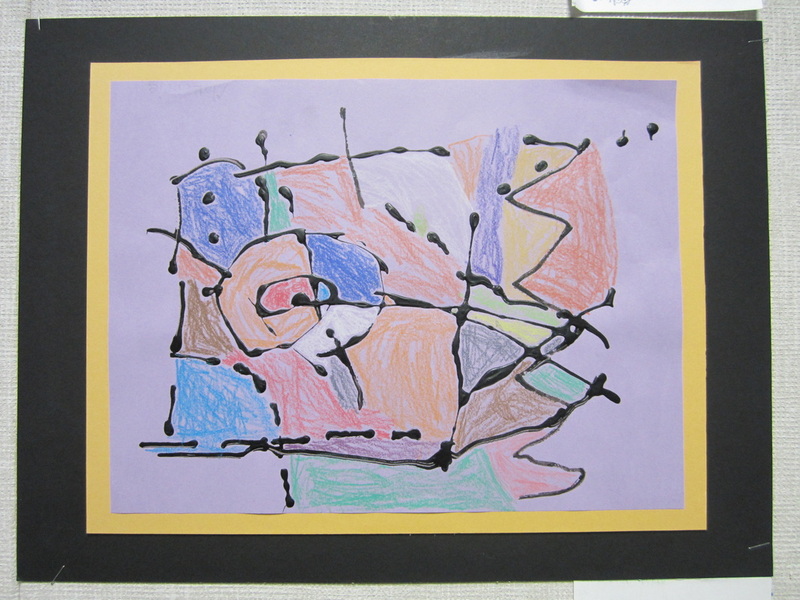 Objective – The learner will be able to recognize the types of line and use them to create a black glue abstract picture. Procedure – I teach the types of line by using motion and dance. Vertical – stand with arms by your side. Horizontal -arms held out parallel to ground. Slanted- arms held out slanted from ground. Curved - Hand motion indicating curves line the mountains. Broken- draw in the air. Spiral- draw in the air with pointer finger. After we learn the lines with motion, we draw them with glue dyed with black tempera or India ink on brightly colored construction paper. The glue takes a day to dry. During the next class, the students use construction paper crayons to color the spaces created by overlapping lines. Materials- Colored construction paper, glue dyed black, construction crayons, pencils.